I had this beer at the Flying Saucer in Addison, TX. We went there to celebrate an engagement of some friends, and this was a special bottle that they had on hand. It was pretty good. 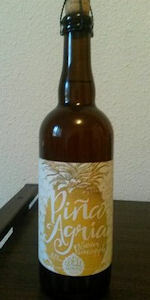 It had a strong flavor of pineapple, but it wasn’t as sour as I was hoping that it would be.